www.nasonline.org Programs Awards 2019 NAS Awards Robert C. Kennicutt, Jr.
Join us in congratulating Robert C. Kennicutt, Jr.! 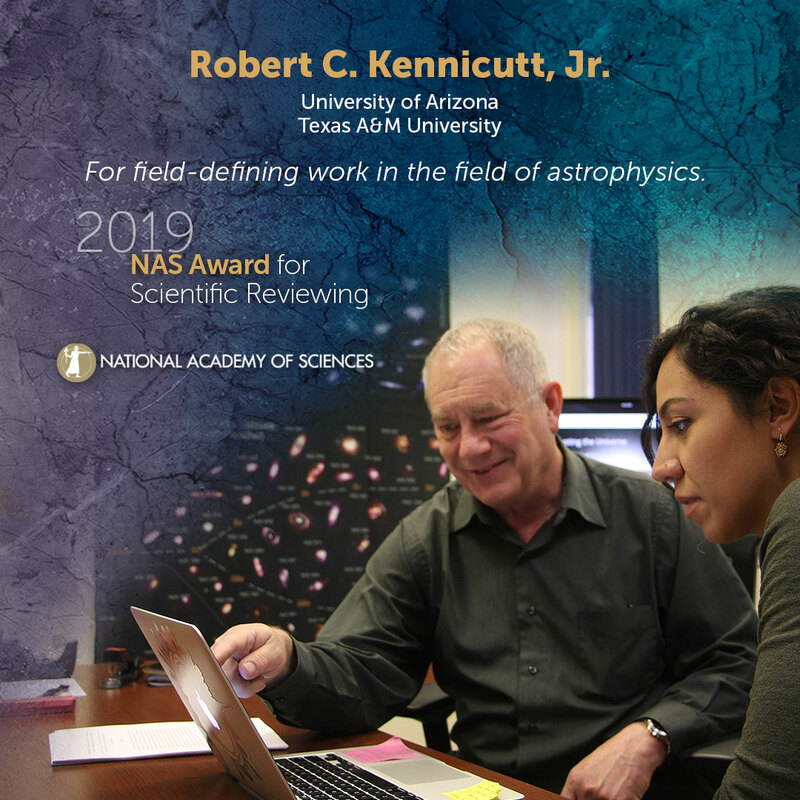 Robert C. Kennicutt, Jr., University of Arizona and Texas A&M University, will receive the 2019 NAS Award for Scientific Reviewing, presented in astronomy. Kennicutt’s influential 1998 review paper, “Star Formation in Galaxies Along the Hubble Sequence,” has become one of the most-cited papers in astrophysics. The paper synthesized a broad review of stellar formation, proving a critical intellectual foundation for the field, and also gave birth to two new fields of investigation: the characterization of tracers of star formation rates and the study of the connection between gas and star formation in galaxies. Kennicutt is also known for the Kennicutt–Schmidt law, which defines a relation between the gas density and star formation rate in a given region, and for his role in constraining the value of the Hubble constant, the unit of measurement that astronomers and astrophysicists use to describe the expansion of the universe. He served as co-leader of the scientific team that definitively measured the expansion of the universe, and continues to research new methods to characterize the evolution of nearby and distant galaxies. The NAS Award for Scientific Reviewing has been presented annually since 1979 to recognize authors whose reviews have synthesized extensive and difficult material, rendering a significant service to science and influencing the course of scientific thought. The 2019 award honors reviews in astronomy and carries with it a $20,000 prize. The award is sponsored entirely by "Annual Reviews." Please use the following sample social media posts and other materials to congratulate Robert C. Kennicutt, Jr.